It's ironic, considering how much such things freaked the Hell out of me when I was a child, that I should now have such fond feelings for them. As I mentioned in the flashback post I'm resurrecting today, I was terrified by spooky things when I was younger. But at the same time, I was inexplicably drawn to them - I couldn't turn down a good horror movie if my sanity depended on it. Which it very nearly often did. Take for instance the movie I watched with my fiancee this past weekend: Amicus' The Skull, starring one of my all-time favorite genre actors (and fellow war gamer) Peter Cushing. A finely written (it was adapted from a story by Robert Bloch) and filmed Gothic treasure, it's a movie I haven't seen since I was maybe 10 years old. I recently purchased the DVD, having been meaning to do so for several years, and was instantly reminded how it affected my younger self. For a long time after first viewing The Skull - maybe years! - I was terrified to turn around or look over my shoulder when I was alone in my family's old farmhouse. I just knew there was a disembodied floating skull directly behind me, and that to turn and face it would bring my instant doom and eternal torment! I distinctly recall one night sometime after this, when I was still afflicted with the dread of the Skull Over My Shoulder - a late autumn wind storm was buffeting the old farm house, and woke me from a nightmare-ridden slumber. The wind wailed and moaned, and my bedroom windows rattled incessantly as the wind whistled through the cracks around them. I bore it as long as I could, but finally could take no more and fled to the living room. I had spent many nights there, sleeping with a light on. My bedroom was no sanctuary, as I had been tormented by creatures there on many nights, and had even been dragged into the abysmal black depths of my closet, through the evil hole in the wall therein. All in nightmares of course, but we all know how fine the line is between dream and "reality." Unfortunately, on this night, the lighted living room would offer no reprieve: I had just settled in when the lamp above my head went dark! I rose warily and tried the light switch again and again, as the wind wailed and beat at the picture window behind me. My muscles stiffened in fear, and with each "click" my every movement and thought became equally labored as the dread spread throughout my entire body. As my eyes adjusted to the dark, I moved as quickly as I could - which seemed unnaturally slow, as if moving through molasses - to the stairs, hoping to reach the safety of my parents' bedroom on the floor above before that protective barrier of glass gave way and admitted entrance to the Thing Outside That Wanted To Eat My Soul. I trudged up the stairs, forcing my frozen legs to move, step by agonizing step. As I reached the top and turned - ever so slowly, it seemed - to go up the hall to their room, it happened: a howl - no, a protracted screech, like nothing I'd ever heard before (and, honestly, since) resounded through the house. It was like a tormented woman's scream and a dying cat's shriek were carried upon and fed by the howling wind. I felt real, sudden terror at that very moment. My paralysis broke as the adrenalin tore through my limbs, and that last fifteen feet to my parents' bedroom went by in a blur.. Although 1981 was "The Year" as far as my gaming history is concerned, 1985 was almost as important to that history - and perhaps more important in terms of who I am today. I was - by all accounts - a timid kid. I was shy and sensitive, imaginative and introverted - and easily frightened. I can still recall some things from my childhood that terrified me for years: seeing an ad for The Exorcist on TV, with a young girl being thrown around on her bed as she begged her mother to "Please, make it stop! "; watching the TV movie Don't Be Afraid of the Dark - in the dark - in my older sister's room; watching The Skull on "Monster Movie Matinee" and seeing Peter Cushing, the hero of so many Hammer Horror Dracula movies get killed by a floating skull; being taunted by my older siblings with tales of the ghost that they claimed haunted the dark cellar of our old farmhouse. These things, and others, tortured my fevered imagination for years, providing more than enough fuel for the horrible nightmares I experienced almost every night for most of the 1970's. Because of this, I generally avoided anything having to do with the horror genre. At the same time, though, I was a huge fan of the aforementioned "Monster Movie Matinee" and - to a lesser extent - its later competitor, "Eivom." Mostly, MMM played old 50's sci-fi movies, which I absolutely loved. When they played Hammer or Universal films or movies starring Vincent Price, I didn't mind them so much, but they were usually only mildly scary. I also watched TV's "Night Stalker" and "Night Gallery," but only rarely - these were about as much as I could take, and almost always came back to haunt me (pun possibly intended) in my sleep. As the 80's replaced the 70's, and Star Wars and Dungeons & Dragons and Atari replaced pretty much everything else, the nightmares began to subside and I began to overcome my childhood terrors. I was still not a fan of the horror genre, but it had less of a deleterious effect on me. In the late spring of 1985, I was 18 years old. I was commuting to college, had my own car, and a job. 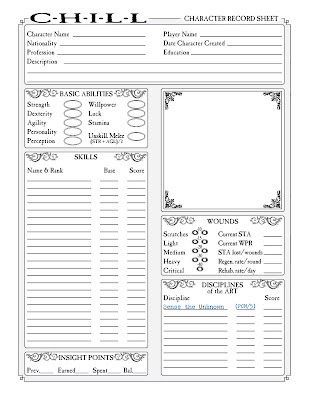 I'd been playing RPG's for over four years - first D&D, then Top Secret. 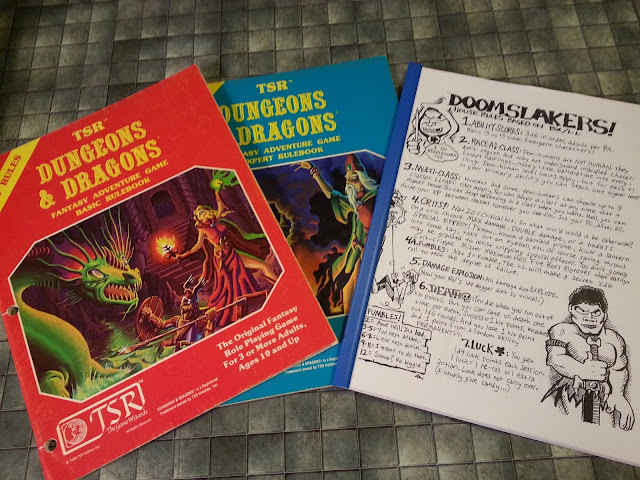 Up to that time, the only RPG paraphernalia I'd purchased had come from Kay-Bee Toys, Walden Books, or (in one instance) a hobby shop I'd found while vacationing in Massachusetts. But the previous year, some time in the spring, I had heard a radio ad for a local game shop called A&J Hobby. I made a lone trip there, and from the moment I set foot into the store, I was in love with it. Here, at my fingertips, were so many things I'd seen for years in Dragon magazine, and more. Unfortunately, I didn't have much money at the time, so all I walked out with was a game I would come to really love: Villains & Vigilantes. A&J Hobby - as it turned out - was only about a mile from the college I was attending in 1985, and right on one of the main ways to get home. I wouldn't say I was a frequent visitor, but I stopped fairly regularly to check out their stock. It was on one of these stops, in late May of '85, when a game in the storefront window caught my attention: It was in a brown box. The cover bore the image of a man clad in early 19th-century dress, standing in the midst of a wind-swept cemetery, being stalked through the moonlit night by creatures only hinted at by a pair of glowing red eyes in the background and a hairy claw in the foreground. The game's title was proclaimed in a cliched-but-not-out-of-place ghostly typeface: Chill. Like most of us, I've bought plenty of things on impulse. Granted, as the years have piled on, I've become far more jaded and less easily moved to purchase based on pretty packaging - but even today, I can still find myself seriously considering buying a product if the packaging connects with the proper sensory input. What I saw when I walked past that shop window was an image straight out of my youth; an image that conjured up Saturday afternoon in front of the TV, watching the camera dolly over the carefully crafted miniature landscape of MMM, down to the creaky bridge, over the misty swamp, up the jagged steps, and through the doors of Monster Mansion. Watching Peter Cushing and Christopher Lee, in all their scenery-chewing glory. Feeling the thrill of being frightened (but now without the fear of the nightmares that would surely follow). Yessir - I was sold on Chill the second I laid eyes on that Jim Holloway cover. I still recall getting home that day and breaking out the game: It had started out as a fairly sunny, late-spring day. It was warm, but there was the slightest chill to the breeze. As the day wore on and I arrived home at the old farmhouse with my newfound prize, the clouds moved in. By the time I sat down at the dining room table to read the book, it was dark gray outside the windows, and the slight breeze had given way to utter stillness. It was warm still, and though the skies threatened rain, none came. Then, as I opened the rulebook and began to read, a misty drizzle begn to fall. At that moment, I had not only finally overcome my fear of The Unkown, but I had - that gray day - embraced it. I'm still a huge fan of the horror genre, in all its forms and media. Since that day, I've probably played more horror games than any other genre, watched more horror movies/TV than any other genre, and read/written more horror fiction than any other genre. Since that day, I have fully explored and come to terms with the sources of my childhood fears, and even though the nightmares I have now are more terrifying by far than any I had as a child, they are - thankfully - few and far between. In terms of the game itself: Chill isn't the best system ever written. (I've never been a fan of resolution tables.) But it does its job well - the entire system is constructed to foster the theme of the game. And the rules are presented in a package that, IMHO, conveys the game's atmosphere perfectly. I had my own version of The Skull--a short story I found in my 2nd grade classroom called The Thing at the Foot of the Bed. It turned out to be a story about a kid who let his imagination run away with him, but the description was so evocative, it actually managed to get me frightened of something lurking at the foot of my bed! Obviously, the story's moral was totally lost on me. I'm curious about Chill. You mention "the entire system is constructed to foster the theme of the game." Are there mechanics like CoC's Sanity stat or GURPS' Fear Check? Or is it more just general atmosphere? As for Chill, the game has a Fear Check mechanic, yes. But it goes beyond that. 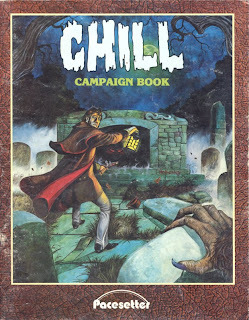 The game oozes atmosphere, from fairly light rules that work fear and willpower loss into the game in a way that has a direct effect on play; to Gothic horror fluff woven throughout the core rule books; to evocative artwork. Even though other horror games have superseded Chill as my group's go-to games, none of them do "Gothic horror" as well as Chill does. Oh, I remember that one! And right after I posted my comment, I went and found "The Thing..." on YouTube as well. I think I'll have to listen to all the stories on that LP--someone's put them all together in a playlist. Dang, I might have to check out Chill now. If I recall, you recommend the Pacesetter version over the Mayfair version, correct? @David: Yes, I prefer the Pacesetter version. But I can't say that the Mayfair version isn't a great game in its own right. Its rules are a little tighter, so it's got an advantage over Pacesetter. But Mayfair's edition evokes a 90's, post-Vampire: The Masquerade sensibility - it lacks the Hammer Horror-esque vibe that Pacesetter's edition has. You really can't go wrong with Mayfair's Chill, but if its the "dripping with Gothic horror" atmosphere you're looking for, Pacesetter's Chill beats Mayfair's. At the risk of further muddying the waters, I should mention Goblinoid Games' recently released Cryptworld. It would be Chill 3E if GG had the right to the game. It's more Pacesetter than Mayfair, from what I've read so far, but it doesn't feel quite as complete as either of the earlier versions. (That may well change as new supplements become available, but the core rules feel more like Chill Lite to me.) So, if you have issues with playing OOP games, or prefer new and shiny games, Cryptworld may be the right choice. If not, I'd still recommend Pacesetter. YMMV, of course. This is all IMO.